Image Size: 25"w x 20"h.
In a family where Dad can strike instant regret with just his glare, this child knows it’s in big trouble. Mom is very satisfied to take a break and watch the fireworks. 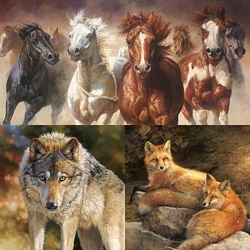 A Bonnie Marris canvas is a private moment with the untamed, an intimate glimpse of the elusive side of the wilderness. And to many, the wolf personifies a wilderness complete. Without it there, there is no balance. For Bonnie, getting into a natural environment and seeing the animals on their own terms is as important as knowing the animals themselves. In Marris’ Fine Art Edition Giclée Canvas "Trouble" it is easy to see that passion for her subject is only eclipsed by her mastery of the elements of color, composition, light and emotion. Artist, subject and art each aligned in magnificent perfection.